Catalogue of Organisms: Yay, Machaeridians! I'm back from holiday, and a very good one it was too. Two weeks free from work, free from children, free from responsibilities or restrictions (unless being forced to eat Rocquefort cheese in the hotel room en suite because Jack refused to share a room with the malodorous delicacy counts as a restriction) - what more could one ask? However, the one downside of going away (apart, of course, from the e-mail backlog lurking in wait upon my return) is that I always seem to miss the announcement of some fantastic discovery, and this trip was no exception. Indeed, the publication notice that I found waiting in my in-box was something so huge, so absolutely incredible, so much something that I've been dreaming of for years that I'm worried that the greatest announcement of 2008 has already happened less than two weeks into the year, and it may only be downhill from here. 150 years after their initial discovery, we finally have soft-body remains of a machaeridian! (from Vinther et al., 2008) a, Holotype YPM 221134, part. b, Camera lucida drawing of the part. Colours indicate the trunk (yellow), parapodia (red), chaetae (gray), attachment of shell plates (green), gut (purple) and dorsal linear structure (blue). Abbreviations: os, outer shell plate; is, inner shell plate; aos, anterior outer shell plate; ls, linear structure; cw, cuticular wrinkles; r, rami evidenced by divergent bundles of chaetae. Scale bar, 5 mm. 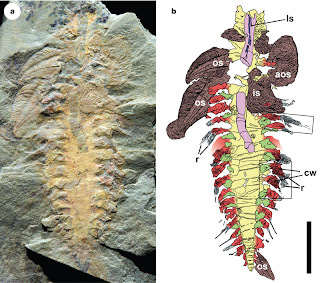 Machaeridians were small invertebrate animals found from the Ordovician to the Carboniferous. Like a number of other Palaeozoic shelled taxa, they possessed a body armour composed of multiple sclerites rather than a single solid shell. Despite often being implicitly dismissed as ultimately inferior or primitive with regard to the more familiar shelled animals that we see around us today, the scleritome body plan was actually very successful (the Ordovician to the Carboniferous was no small stretch of time) and survives to this day in groups such as the chitons. Vinther et al. (2008) state that machaeridian sclerites are near-ubiquitous in benthic marine assemblages of the appropriate time period. The problem is that because scleritome plates are not directly fused to each other, on death the scleritome generally becomes disarticulated and it can be exceedingly difficult if not impossible to reconstruct the appearance of the entire animal in life. As a result, scleritome animals have been swept into the too-hard basket in the past and not received the attention that they probably deserve. 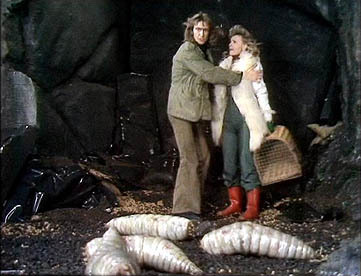 Even with the massive renaissance of interest in problematica that popularised the Cambrian explosion and the Ediacara fauna in the 1990s, the Machaeridia retained their internationally ignored status. Guesses as to their affinity ranged from molluscs to annelids to arthropods (specifically barnacles) to echinoderms. Hence my excitement at the publication of Vinther et al. (2008), which gives us our most complete picture of a machaeridian to date, in the form of an articulated specimen of Plumulites bengtsoni from the Lower Ordovician of Morocco preserving soft body parts. The specimen is not perfect - the preserved soft parts are a little smeared, and the head is missing - but what we have is very informative. Most significant are what seem to be bristle groups running down each side of the body, which the authors feel are probably parapodia. Parapodia are groups of chitinous bristles (chaetae) found in polychaete annelids, and their presence in machaeridians is about as clear as indication of annelid affinities as you can get. 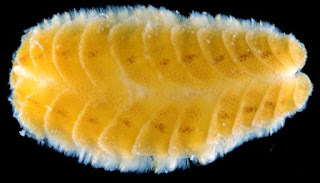 Polychaete parapodia are divided into upper and lower clusters of chaetae, and a few of the apparent parapodia in P. bengtsoni do appear to show branching compatible with such an arrangement. 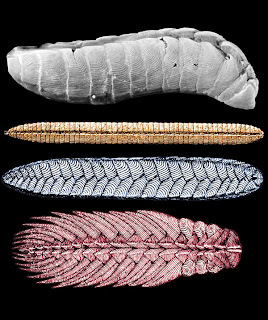 Accepting that machaeridians are closer to annelids than other living animal phyla, it still remains difficult to establish their exact position relative to that group, whether as a stem outgroup or derived ingroup. Phylogeny of living annelids remains almost totally unresolved - annelids possess relatively few phylogenetically useful morphological characters, while molecular analyses are so far unable to even recover their monophyly relative to other phyla (Rousset et al., 2007). A possible relationship to the annelid order Phyllodocida, some members of which possess dorsal plates as shown below in an image of Iphione ovata from here, in Vinther et al. 's phylogenetic analysis was dependent on coding the mineralised machaeridian sclerites as homologous with the chitinous phyllodocidan elytra. Leaving this character as uncertain caused the annelid interrelationships to collapse to a polytomy, with the possibility remaining that machaeridians sit on the annelid stem. As it has also been suggested that phyllodocidans represent a paraphyletic grade relative to other annelids, the two results are not necessarily incompatible. Machaeridians are but one of a number of groups of Palaeozoic scleritome animals that appear to occupy basal positions on the trochozoan family tree - other examples include the sachitids, tommotiids, wiwaxiids and halkieriids*. Interestingly, there is no indication that these groups all form a clade. Halkieriids (shown at left in an image from Palaeos) may be related to brachiopods (Holmer et al., 2002), to which tommotiids are also ultrastructurally similar (Vinther et al., 2008). Wiwaxiids have been interpreted by different authors as related to molluscs and/or annelids, while molluscs of course include chitons (one extinct order of which - the Multiplacophora - possessed a more complex scleritome than modern species - Vendrasco et al., 2004). It seems not unlikely that the scleritome animals as a whole represent the ancestral group of a brachiopod-annelid-mollusc clade, with the three modern lineages arising independently from scleritome ancestors**. The scleritome would have been reduced and lost in the annelids, while brachiopods and molluscs each independently evolved towards more consolidated armation (if halkieriids are brachiopod relatives, then the two larger terminal plates were expanded in the ancestral brachiopod to the expense of the other plates; the mode of evolution in molluscs is a bit more obscure due to more uncertain phylogeny). Of course, this scenario is still pretty provisional, and there are a number of basal shell-less taxa involved such as Odontogriphus, phoronids and aplacophorans that could still potentially cause it to collapse into a quivering heap. As I've so often said in relation to matters of phylogeny, watch this space. *Many of these groups have been included in a taxon called Coeloscleritophora that was also suggested to include the strange Cambrian organisms called chancelloriids. Individual sclerites of chancelloriids do have a similar structure to those of other "coeloscleritophorans", but articulated specimens indicate a radically different body plan for the entire animal with sclerites arranged radially over a vase-shaped form. It seems most likely that chancelloriids were sponge-grade animals unrelated to the other "coeloscleritophorans", but the question is complicated by the complete absense of a living sponge group that is even remotely similar to chancelloriids beyond superficial appearance. **Recent genetic analyses show that these three phyla fall within a clade called Spiralia (or Lophotrochozoa, a name which is used often but for various reasons gives me grief, so I try to avoid it) that also includes a number of other taxa such as nemerteans and platyzoans. Relationships within Spiralia have not been satisfactorily sorted out. It is possible that some other spiralian taxa may fall within the annelid-brachiopod-mollusc clade, which would even further complicate my scenario. Caron, J. B. 2008. Ancient worms in armour. Nature 451 (7175): 133-134. Vendrasco, M. J., T. E. Wood & B. N. Runnegar. 2004. Articulated Palaeozoic fossil with 17 plates greatly expands disparity of early chitons. Nature 429: 288-291. Excellent review of our paper. Glad that we are not the only ones that are into machaeridians. You sometimes think that when you see the publication history of the critters. I think the idea of relating all lophotrochozoan groups based on shell fossils are a bit shaky. They are all very different in structure and morphology and organs they are derived from. For example, Machaeridian shell plates are bourne from extensions at the parapodial root which have a constricted base. That would usually be called cirri or elytra in modern polychates. Brachiopods and Mollusks has got more elaborate mantle. Finally the ultrastructure and biomineralogy is different in all forms. As we also state in the paper, we don't think there is much reason to link brachs and annelids through machaeridians. Finally, halkieriids have been made stem group brachiopods by Conway Morris. However that was a scenario based hypothesis in which you had to accept an immense amount of tentative steps of which there is no evidence for. A number of molluskan specific characters was ignored in this hypothesis. I assume you must have read Vinther and Nielsen 2005 (find it on my webpage) or else have a look at it, its a little outdated, but I will return with more information on halkeriids soon. I think we need lees hypothesizing and more actual evidence before making more grand scheme ideas on lophotrochozoan phylogeny. The understanding of the group is still in its infancy. Thanks again for your review and ideas. Its great to see one of the guys on the crunchy side of invertebrates caring for the squeeshies. Jakob; thanks for commenting. It's always gratifying (and a little unnerving) to receive comments from the authors of the study you've just finished flensing. Even if the scleritome form is polyphyletic (as it undoubtedly is to at least some degree), I'd also be interested to know why, after so many millions of years of success, the scleritome body plan fell out of favour except in chitons and maybe some annelids depending on how you define 'scleritome'. 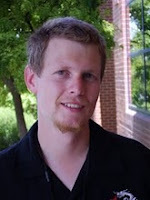 And if anyone else would like to check out Jakob's work, the webpage he mentioned is here. Don´t be too unnerved. Its great to discuss these things and I don´t mind taking this discussion in an open forum. You are right that there is a many scleritome bearing cambrian organisms. And you are right, there is no doubt that the tommotiids are stem group brachiopods. However, there is no obvious links between them and halkieriids or machaeridians. I think that part of the reason for the early "EXPLOSION" of sclerites is partly due to a taphonomic window of phosphatization that preserves minute skeletal structures that ends in the middle Cambrian and has never occurred again. We could probably find the same diversity in modern oceans, we just don´t find them as aberrant. As you say there is tons of modern organisms with sclerites, its just a matter of definition. Self-correction: The phrase I earlier attributed to Mikko Haaramo actually was taken by Mikko from Toby White. rudimentary organisation - but who knows evolutionary stasis may have conserved this basic structure to this day. What do you reckon?